The Early Rider Spherovelo is currently unavailable. The Early Rider Spherovelo is part of the balance bike collection on offer from Early Rider, who also offer the beautiful Early Rider Lite and Early Rider Classics which are firmly established as top quality balance bikes. Early Rider have taken recognised that some parents might want to start teaching their children the concept of balance from an even earlier age, and this is where the Early Rider Spherovelo comes into play. 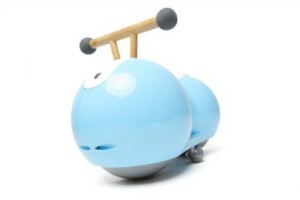 Although it is not a balance bike in the traditional sense of the word, the Early Rider Spherovelo introduces the concepts of balance and co-ordination to very young children. It can be used by children as young as 7 – 10 months (with parental help), but is mainly aimed at toddlers aged between 1 and 2 as a precursor to a ‘normal’ balance bike. This means the wonderful world of balance bikes and cycling is available for toddlers who can learn to ride before they can walk! The Early Rider Spherovelo is very different from any other balance bike around, as it comprises of two spheres encased in a hard wearing polyurethane covered shell complete with a moulded saddle and handlebars. The front wheel rotates on a normal bike axis, so what makes this product unique is the rear spherical wheel which rotates on all axises providing manoeuvrability. The Spherovelo has two main settings, with the ‘stable’ setting designed for the youngest riders. In this setting, the spheres are supported by stabilisers which mean that the bike can’t topple over and if the rider loses balance it will just move in another direction as dictated by the rear sphere. This can result in the Spherovelo heading in all sorts of different directions, but it will allow the child to start building some confidence to remove the stabilisers and move into the ‘balance’ mode suitable for children 12 months or older. The stabilisers are removed at this stage, which means that the rider will have to exert some control on the bike to stop it toppling over, hence improving essential motor skills. It is still much more difficult to fall off than a normal bike and should avoid too many toddler tears! The Early Rider Spherovelo allows children to start developing motor skills at a very young age, and it is a revolutionary product in the balance bike market that has won several awards. It is mainly designed to be used inside on a smooth wooden floor or carpet – but could also be used out in the garden on a sunny day. It is also a surprising nimble little bike, so once the child gets the hang of the concept they should be able to zoom around the house or the garden in much more style than a traditional baby walker. It is a great option if you are looking for a bike for a very young child, and it is available in four different colours including white, blue, red and green.